"III: In the Eyes of Fire"
No, UNEARTH has not mellowed, nor have they altered their sound to fall in line with the oodles of growl 'n' crooners invading every mall in America. If you thought that "The Oncoming Storm" was a ripping American metal album, wait until you hear "III: In The Eyes of Fire". Enlisting producer Terry Date (PANTERA, DEFTONES, SOUNDGARDEN) and dispensing with the click track, UNEARTH leaves no stone unturned in creating a monstrous album that incorporates elements of everyone from IRON MAIDEN (guitar harmonies) to the best of the Swedish melodic death metal bands. The organic sound is hardly raw, but it is not nearly as polished as what was heard on "The Oncoming Storm". The refusal to bow to trends or soften its sound is apparent from the opening notes of the ferocious "This Glorious Nightmare". Guitarists Ken Susi and Buz McGrath are the X factors here. Both unleash riff after heavy riff, as well as excellent MAIDEN-esque harmonizing and blazing solos. The dueling solos on "So it Goes" hint at the band's more traditional metallic influences. The album's bottom end is thick and reverberating due to John "Slo" Maggard's fat four-string and drummer Mike Justian's concrete-busting approach. The combination of dangerous riffing and twin guitar firepower is apparent all over the album. "Sanctity of Brothers" and "This Time was Mine" boast outstanding thrash licks and a fantastic melodic sensibility (especially the former), even amidst Trevor Phipps' unwavering scream-shout. At times it seems as if Phipps' from-the-gut, face-reddening vocal style will cause his head to explode at any moment. In short, you'll find no pretty vocalizing or anguished crooning here. There are several moments of rhythmic stomp and chunk riffing as well, "Unstoppable" and the title track two cases in point. Closing with instrumental "Big Bear and the Hour of Chaos", which includes enchanting piano playing, allows the lava-hot metal of the prior tracks to cool and the listener to regain equilibrium. With a lot of upside, "III: In the Eyes of Fire" should disabuse anyone of the notion that UNEARTH is somehow just another metalcore band. 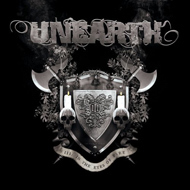 Rather, UNEARTH is an aggressive METAL band with chops and an ability to write memorable songs. "III: In the Eyes of Fire" is proof of it.